Congratulations to Ben Skinner for triumphing in the British National Longboard Championships again. The event was held last weekend in Jersey and also saw Sennen Cove regulars Sam Bleakley and James Parry in the final. Skindog is one of the finest surfers in the UK, and I was lucky enough to watch him shredding - on a longboard - in Barbados a few months back. He was joined then by the UK's most successful surfer, Russell Winter, and his long-time Newquay partner in surfing, crime and perhaps the occasional pint, Ben Baird. I saw the pair this weekend, too, at the White Stuff Surf Relief event held at Watergate Bay. This, stop No. 3 on the UK Pro Surf Tour, was a top event held in some decent surf, duly won by Mr Winter (who promised, incidentally, that he would find time for an interview soon - and Russ, if I can catch up with Chris Tyler, who lives in Bulgaria, surely it's not impossible to interview you?!). But while I continue my quest to interview Russ - and, after this lunchtime's dismal onshore rubbish, cast my mind whimsically back to Barbados - you can check out what Winter, Skinner and Baird made of one of the rare northerly swells which lights up the Bajan west coast in the latest issue of Carve. 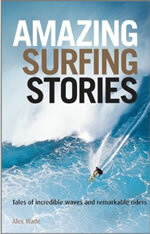 A great issue which also has some truly awesome shots of St Ives big wave charger Tom Lowe (shown in the footage above). Picture of Skindog on the nose courtesy of Peter Journeaux (Is that a made-up name? Ed.) while that of Russell Winter is by Jason Feast.